The words are placed tactically to comment on the image and situation, directing our attention towards aspects of the image they’re arranged on. More importantly, they point at what isn’t in the images, developing an event in our minds. The node displayed in the image above, for example, plays with the positioning and frames of reference of the words “upper” and “downer.” The placement of the words gestures towards the relative positions “up” and “down,” but they also can represent types of drugs: stimulants versus depressants. 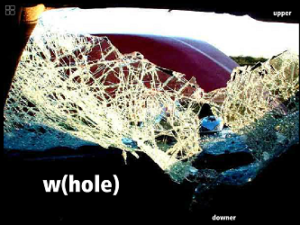 When juxtaposed with the word “w(hole)” and the image of a shattered windshield with a hole in the middle, the words could also suggest a body flying through that hole (up) to land (down) on the ground we cannot see. Seen as a whole (pardon the pun) the “verbivocovisual” composition tells a story larger than the sum of its parts.